Dog Stole the Show Despite his Owner’s Teasing! Since we cannot actually understand everything our pet says, we have to resort to the amazing lip syncs and voiceovers created by pet owners abroad! Listening to these videos you get in insight into the the funny and amusing conversations many pet owners have with their pets. In one such video, a man is teasing his dog about meats. The two are sitting in the living room and the man announces that he found some delicious maple bacon. The dog’s ears perk up and with excitement he turns to his owner only to hear the owner announce that he ate it. “You’re kidding!” the dog exclaims in disappointment. Sadly for the dog, the man was not. The convo continues as the man tells his dog that he then found some beef in the fridge. “Yea” says the dog hopefully, prompting the man to continue. A big juicy steak that the man claims to have eaten as well. The dog listens intently, turning his ears to catch what the man is saying when the man claims to have found some chicken that he covered with treats and sprinkled with cat treats. The dog’s eyes grow wide in anticipation. Can you guess what happens next? Take A Look At This Hilarious Video Here! Most Adorable TV News Blooper The World Will Ever See! 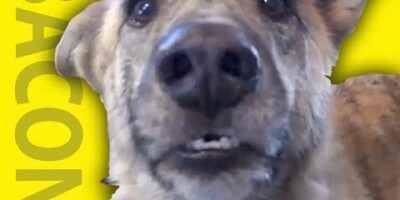 Rescue Dog’s Hilarious Response When Owner Says Cheese!